The first part of 2018 turned out to be a stellar start to the year for our research group. We had several students graduate (Evan, Eunnam, and Liwei) and for celebration some of us out for a nice lunch. 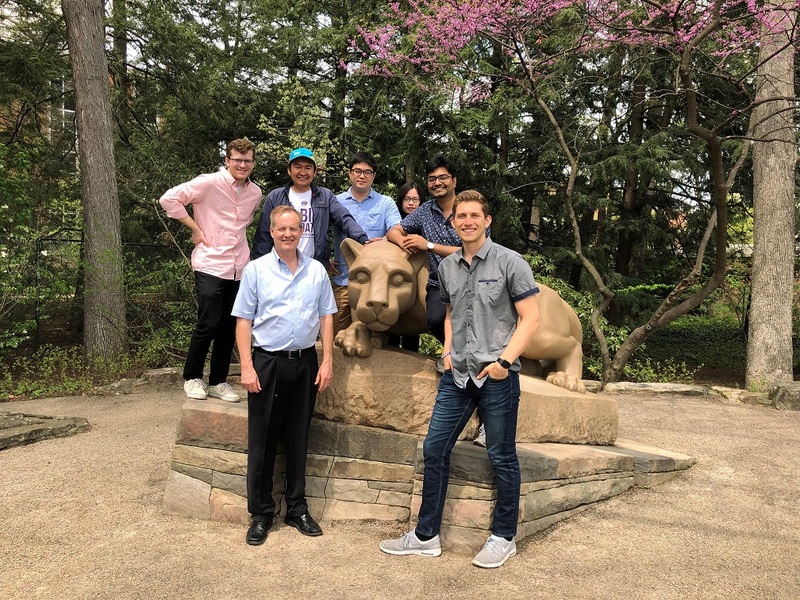 After lunch we took a photograph with the Nittany LION! The lion is the 2nd most photographed item in Pennsylvania, next to the Liberty Bell in Philadelphia. Eunnam and Liwei are still completing some final touches on their theses and journal papers, while Evan is starting to work with Range Resources in June. Evan is also preparing two papers for next Fall’s SPE ATCE meeting in Dallas, where he is competing in the SPE international paper contest in the MS division, after winning 1st place in the regional contest. Dr. Johns also received several awards including the College’s Wilson Research Award for Excellence, which is given to one faculty member each year (see video link below). He also received the George E. Trimble Chair, a two-million-dollar Chair that provides money each year for students, equipment, or other needs. His sabbatical was also approved for Fall 2018 and Spring 2019, where he plans to visit Colorado School of Mines, University of Texas at Austin, and ETH Zurich (these plans are in flux, just like Darcy’s law). On the research side, his group has proposed a new way of thinking about shale oil and gas recovery. They have demonstrated that diffusion alone can explain recoveries from wells, and have derived expressions for ultimate recoveries that match well what is observed in the field. Darcy’s law is not needed, and fracture permeability is not as critical.